All the while we have been seeing or hearing new consumer electronics product designed with Intel Atom surrounding netbook design and you may not realized that actually the tiny but yet thermally efficient Atom processor has been used in other segments such as medical segments. Just recently, Arbor has announced the availability of new 12-inch touch panel tablet PC targeted for medical applications as a MCA (Mobile Clinical Assistance). Named as M1255, it is powered by N270 Intel Atom processor clocking at 1.6GHz with some of the features requirement being tailored towards medical industry. Some of the functionalities include an embedded 2.0 Megapixel camera module, fingerprint and RFID reader, 2D Barcode scanner, Bluetooth, wireless 802.11 b/g/n as well as wired 10/100 Ethernet port with networking capability. Besides, it includes a 2GB on board RAM and an 1.8-inch SATA Hard disk drive with 60GB of storage space. Thanks to both of its companion chips – 82945GSE northbridge and ICH7M southbridge that can extend the peripherals connectivity beyond conventional netbook capabilities specifically for medical segments. That is not all, the new device is claimed to be compliant to industry IP54 standard which can tolerate high humidity and dust environment. 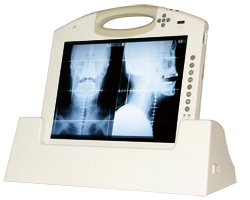 No pricing and availability yet, M1255 is capable to run with Linux, Windows XP or even Vista which makes it a powerful all-in-one gadget for medical use.